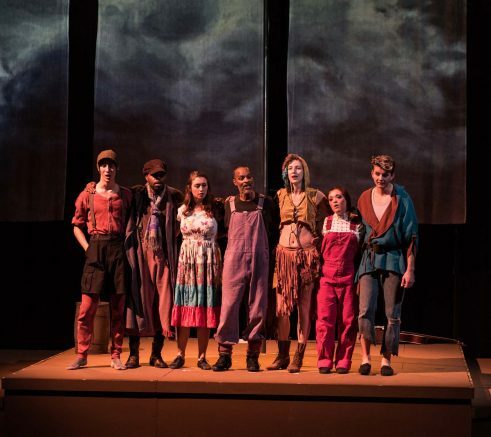 “The Shepherd’s Play” proved to be an out-of-this-world experience for audience members that showed up to the first as well as its second run of the play. The play combined three play excerpts together, “Nativity”, “The Second Shepherd’s Play”, and “Everyman” which when combined provide an amusing twist to the traditional story of the birth of Christ. The traditional celebration of the Christ Child’s birth is a well known story: the virgin Mary gives birth to the Jesus Christ in a stable on a cold winter night. Throughout the play though, we come face to face with a plot that tells a story within a story, contrasting between the spiritual and modern theme to appeal to modern-day viewers. Intertwined within the religious events of the story, the play inserted humor, pole dancing and many variations of music to tell the story in a way that modern day viewers can understand and connect with. One might ask, what does pole dancing have to do with the religious aspects of Christ’s birth? The answer is: nothing. However, the absurd acting, humor and pole dancing is what unexpectedly perks the plot and takes the modern adaptation of an ancient story to another level. The play leads to its peak as a humorous trio of shepherds who are searching for their stolen sheep finally come face to face with the culprit. Hands down, one of the most captivating and fascinating characters in the whole production is Death herself. Death, acted out by Kimberlee Wilson, is a bedeviling character that torments and afflicts Everyman, the protagonist of the play. Dressed to look like death itself, Death represents what every person will one day come face and strikes down those she determines must die. The play further portrays every man’s attempt to avoid death, who realistically can’t be escaped. Aside from the underlying dark themes and turns tunneled throughout the production, the play presents itself in a lively and surprising story all the way to the end. On that note, one of the most awe-provoking realizations that will leave a lasting impression in the audience is the skillful and talented actors that take a complicated subject matter and present it in such an eloquent manner. The actors not only performed well, but they connected with the audience through dancing, singing, humor and through sharing the realities of life as well as the ancient life – they are the epitome of what performers are. Playing the role of Mary was Caramel Suchard, who had previously performed in three other plays at American River College, “The Tempest”, “Beauty and the Beast” and “Cabaret”. Rayana Wedge, who played as a sheep and townsperson commended the talented actors, tap dancers and singers that she was surrounded with in the play. Wedge also appeared in “Cabaret”, playing the character of Kit Kat Girl, and has many talents that range from tap dancing, singing, and many musical talents. Katya Novskaya played the role of Gill, the wife of a main character in the play; it was one of the first leading role as well as antagonistic character that she ever played. “It was fun working with the group…there was no drama happening behind stage, “ said Novskaya. “I was very nervous about my pronunciation, since I’m Russian”. Avram Williams is an ARC student who had seen a lot of shows in the ARC theater as a part of the stage crew working the lighting. He described the show to be “very different and interesting,” as compared to those he previously had seen. Along with Avram Williams, the other hardworking hands behind the scenes who made the flow of the play run smoothly were Zeke Armstrong, Dylan Ballestero, Melynda Blanchard-Williams, Ben Harris, patrick O’Reilly, Lindsey Platt, Nicole Theep and Annelies Veldman. The “Shepherds Play”, in conclusion, would be deserving of a 4 out of 4 rating, as would any cast who connected with the audience and showed an astounding performance as they had. Be the first to comment on "Review: “The Shepherd’s Play” takes modern adaptation to another level"